Family and friends mourned the loss this week of Steve Orloff, University of California Cooperative Extension Farm Advisor, who passed away October 3, 2017 from cancer. Steve Orloff advised many farmers, industry members and conducted research on many crops, including alfalfa. Steve is remembered for his great sense of humor, his dedication to his family, his friendship to many, and his immense service to agricultural science. He served as a University of California Cooperative Extension Farm Advisor for more than 33 years. 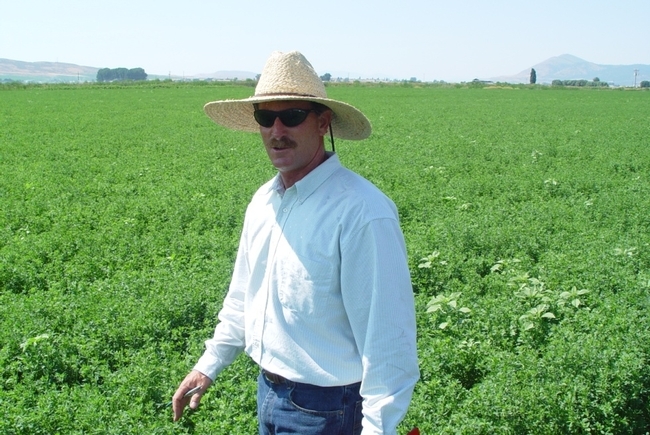 The alfalfa industry, in particular rues his loss, since he contributed greatly to this important California crop. A True Agronomist. Steve Orloff was a true agronomist with broad knowledge and in-depth expertise related to most fields of agriculture science. He published hundreds of articles reporting on his original research related to pest management, irrigation, harvest management fertilization and variety selection. Steve worked with many crops including alfalfa, grass hays, small grains, onions, and several specialty crops. His accomplishments played a vital role in progressing California agriculture and helping solve many regional problems related to pests, water conservation, and economic stability. The publications “Intermountain Alfalfa Management' which he led in the 1990s, and “Irrigated Alfalfa Management for Desert and Mediterranean Zones” (2008) which he made significant contributions on are considered the leading nationwide references to management of alfalfa. From Southern California. Steve grew up in Lancaster, California, where he learned to appreciate agriculture in the high-desert communities of Los Angeles County. It was also in Southern California that Steve learned to surf the waves, literally, and became an expert surfer – a passion he continued to cultivate throughout his life. Steve spent several years in Central America serving in the Peace Corps, primarily El Salvador, where he worked with marginal farmers struggling to survive in this tropical, crowded region. He met his wife-to-be in Honduras during this period. After graduation with an MS in Crop Sciences from San Luis Obispo, Steve took the University of California Farm Advisor position at Lancaster, CA. Although he had said that the job required a steep learning curve, he was aided by the many experts in crop production in the region, farmers and ranchers, PCAs, and crop specialists at UC Davis and UC Riverside who appreciated his dedication to his scientific solutions to important problems. To the Northern Mountains. After making significant contributions in the high desert region, Steve made a momentous change in his life-to move his young family, now with three children, from the high desert of Los Angeles County to the high mountains of California, to take a position in agronomic crops at the UC Cooperative Extension office in Yreka, Siskiyou County, where he has lived for more than 24 years. In many respects, this was a good fit- given the dominance of alfalfa as a major crop, the confluence of crop rotations with small grains, pasture, and specialty crops, and the importance of irrigation in a dry environment. There Steve quickly established himself as a regional expert on many crops including alfalfa, conducting significant research on-farm as well as at the University of California Intermountain Research and Extension Center at Tulelake, CA. Steve had as special interest in weed management. His work on the control of dodder, a major weed in alfalfa production in California, during the 1980s became the gold standard for management strategies for this important and difficult parasitic weed. More recently he conducted much of the university evaluations with Roundup-Ready alfalfa, including techniques to prevent weed shifts and resistance in this system. His sharp observations and excellent field research also identified a novel crop injury phenomenon in intermountain Roundup-Ready alfalfa in 2015-2017. He continued his field research right up until the time of his recent diagnosis in August, 2017. Widely Appreciated by Farmers. Steve was beloved by growers and industry representatives in California, the West, and nationwide due to his robust research program, excellent crop management knowledge, and his great ability to extend information in a fun and easy to understand style. He was a widely sought after speaker at state-wide and regional events, including the Western and California Alfalfa Symposium, Western and California Weed Science Society Conferences, and annual grower meetings in New Mexico, Utah, Nebraska, Washington, Arizona, Idaho, Oregon, and Nevada. He was a regular contributor to research presentations at the UC Intermountain Research and Extension Center, and at UC Davis. His thoughtful analysis and presentation of his own research data was always a highlight of any meeting, including his incorporation of humor that always enlivened the crowd. Steve gave many talks and conducted programs internationally in alfalfa and agricultural development, including Spain, Romania, Chile, Argentina, China and Mexico. His talent and his in-depth knowledge was appreciated not only by many farmers and industry members in California, but throughout the nation, as well as internationally. 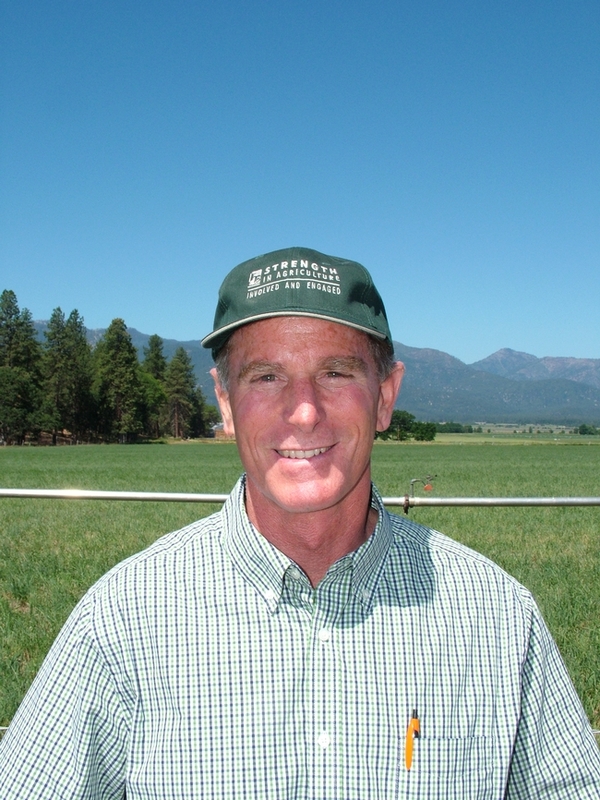 He has received many awards including the Jim Kuhn Service Award from the California Alfalfa & Forage Association in 2011. The most important attribute of Steve, though were his personal characteristics. He was personal friends to many farmers, industry members and university colleagues. He was valued not only for his accomplishments and intelligence, but his ability to light up a room and to engage on nearly every subject. He deeply loved his family and community and will be sorely missed by all. Steve is survived by his wife Islia, sons Rob, Michael and Danny, mother Carol and sisters Lisa and Diane. Celebration of Life. A “Celebration of Life” event for Steve Orloff will be held at 4 p.m., Saturday, October 14, 2017, at Five Mary's Farm in Fort Jones (117 miles north of Redding, 22 miles southwest of Yreka). Everyone is welcome! A catered community BBQ will follow at the same location. This will be an outdoor event so please be aware, that as the sun sets, mountain temperatures can drop rapidly. Five Mary's Farm is located at 6732 Eastside Rd, Fort Jones, CA 96032. Cards can be sent to the Orloff Family, c/o Cooperative Extension, Siskiyou County, 1655 South Main Street, Yreka, CA 96097. (530) 842-2711. It is with deep sorrow that we say goodbye to a wonderful friend, colleague and excellent human being. Steve was a good man and will be dearly missed. All my best to his family. Thank you for sharing him! He was a mentor, colleague and friend and I'm grateful that I got to work with him throughout my career. Steve was a great guy, I learned a lot from him. One of the great blessings of my career was meeting and working with Steve. Steve was always helpful answering any questions! He was sympathetic and a kind person. He wil be greatly missed! Steve's passing is a shock and an incredible loss to those of us in the alfalfa industry and to agronomists all over the world. As a retired Cal Poly professor I knew him as an enthusiastic and outstanding student. Since then his value to me as an important resource in my involvement in my teaching, as an important resource for my involvement in CWSS and in CAPCA, and currently as an agronomist and grower in Nevada. You will be sorely missed, Steve. What a shock and a tragedy. My heart goes out to his family and friends and colleagues. Steve had great respect from his fellow forage workers in the West. His knowledge was broad and deep and he could relate it to producers among the best! Very sad to hear this news. We followed Steve's work and advice up here in Manitoba Canada. Out prayers to his family. He will be missed. Steve was a fantastic speaker and promoter of alfalfa. I recently asked Steve to present on our recent grower program in July in Sacramento. Seems like just yesterday he was speaking to our group about alfalfa. Always amazed things he knew, new ideas, his humor, and discussions with growers and sales people were always outstanding. Steve will be missed by everyone. Very sad to hear this news. I followed Steve's research work in Peshawar and wish to be blessed for his contribution. My prayers to his family. He will really be missed. Steve was the epitome of an applied research agronomist and Extension specialist. I looked to Steve as a role model for what every University researcher and Extension professional should strive to achieve in their career. The alfalfa industry has lost a true friend and champion. But, more importantly, we have lost a wonderful person. I will miss him greatly. Prayers to his wife and family who were the center of his world. My thoughts and prayers to the Orloff family. Steve was one of the most relevant and timely Cooperative Extension members of any discipline who I have known. He was gregarious in all facets of life - family, surfing and outdoors, field research, advising farmers, and presenting understandable results in conferences or small meetings. Thank you Steve for your service when I worked with you on projects in California, and especially your encouragement during my own foray into Extension. I hope that you are riding some major waves on a big ocean. Steve was always very cooperative and helpful. A great guy to work with. He will be missed very much. Our sincere condolences to his family and friends, from everyone at Irrometer. I first met Steve when he was Farm Advisor in Palmdale, chasing him down because of significant research findings of interest to our Capital Press readers. He's been a great source of information and a wonderful person to visit. It's a shock for me to hear of his death. We old folks expect to pass on, but think of the younger guys like Steve as guys who go on forever. Unfortunately I'll be in North Carolina Saturday; my prayers will be with the Orloff family as they gather in Scott Valley to remember a life lived so very well. Steve's wide knowledge of alfalfa management and ability to convey practical aspects of his and others' research was greatly appreciated. His humble and generous spirit, great smile, and quick wit made him easily approachable and a pleasure to be with. Thank you, Steve, for a life well-lived and shared with so many. Steve truly was and in so many ways, outstanding in his field. It's not often you get to meet someone who has had such a great influence as Steve has and I feel privileged to have done so. He'll be missed. Our thoughts and prayers are with his family. Steve blessed many of us with his expertise, can-do attitude and ever friendly openness. You'd think that God must have enough good help in Heaven that he could have left Steve here to help us! Besides our sometimes similar responsibilities to the ag and extension community and general love of "down-in-the-dirt-agronomy" we shared a common heritage as ex So-Cal teenage beach bums. We never lost the love of the surf, but the reality of making things grow so people from Latin America to Africa to the USA can eat was Steve's great joy. I was running a session at a conference and told the audience that I would throw things at anyone whose cell phone rang. Steve ran another session later that day and threw candy bars at the audience. He has a wonderful sense of humor and was an all around great guy as well as being an asset to the UC and farmers alike. Steve was a great man, I got to know him well over the past few years when we served on a committee and worked on deficit irrigation. He was always sharp and funny, just a very pleasant person to work with down to earth. He always gave great presentations and I remember his presentation at the last alfalfa symposium, as always it was practical and to the point, I'm glad that I got the opportunity to know him and learn from him. He will be missed dearly and I'll miss his funny jokes and emails. Counselor. A well lived life. He was the best we had. Steve was the model farm advisor. He had it all in terms of research and production knowledge and the ability to extend information to those that could benefit from it. But more importantly, he was also a truly good person - generous and caring without measure. I can't believe he won't be there to guide us as we plan activities and events in the future. I hope his family understands the depth of appreciation we share for his contributions to this world as a person and as a UC Farm Advisor. He is already missed. It is with great sadness that we say goodbye to this noble man. I have met and enjoyed Steve's presentations and talks. What a great scientist! I wish strength for his family and colleagues at this difficult time. I am deeply grateful to have worked with and learned from Steve over the past few years. He was a gifted leader, a terrific agronomist and an even better person. Steve was the type who made you strive to do your best and brought out the best in everyone around him. Thank you Steve, we miss you already! Steve was a terrific colleague. I enjoyed working with him on multi-state research projects and appreciated his dependability, professionalism, attention to details, and thoughtful insight. He always asked good questions that brought out aspects others had not thought about. He will be missed by all of us who knew him. I pray God will give comfort and peace to his family. It's been very hard to say goodbye to Steve Orloff, valued friend and colleague - he has been a part of my professional and personal life now for more than two decades. From the annual Alfalfa Symposium (Steve was a crucial contributor each year) to writing projects, to international trips to China, Chile, Steve was a valued consultant, idea generator, creative force in agricultural science. He was a main-stay of our Extension and ag. community. I don't think there is a life he touched that didn't appreciate his genuine character and sense of humor as well as his intelligence and insights. Agriculture and particularly alfalfa as a crop has lost a champion. Here's to you Steve! You are sorely missed. As with many of you Steve's death came as a great shock to me. I had just been in contact with him in August, on some upcoming projects. My heart felt sympathies to his family, we would often compare notes as our kids grew up. He was so proud of what they were accomplishing in their life's journey! I like many was so impressed with his knowledge, expertise, and personality. He will be so missed For what he brought to the Farming and Research community. Gods Speed and my condolences again to His Family. I had the pleasure of helping Harry Carlson recruit Steve to join our intermountain cooperative extension team 25 years ago. We knew he was one of the best potential farm advisors for our region, but little did we know that he would be the best farm advisor ever! I worked with Steve for 16 years before I retired, and I can say that he exemplified the best of the best of what we want to be as farm advisors. Steve was always optimistic about what we could learn from applied on farm research. He also had a passion for explaining what we learned in field tests to our farmers and others throughout the pacific northwest. On a personal note, Steve was one of the most considerate, caring, and respectful individuals I have ever known. Steve was the very soul of UCCE Farm Advising, and his passing leaves a hole in our hearts as well as in the ranching and farming community in the mountain valleys and hills of northern California. Steve exemplified hard work, intelligence, care for others, and integrity -- the UCCE Farm Advisor's badge of honor. Although physically far away from Berkeley, I could always count on Steve to be on top of things and offer to help when needed. I enjoyed working with him because he was always knowledgeable and ready to share that knowledge with others. One of the few people for whom I was willing to drive up to northern CA to help out with conferences he organized! I will miss him a lot. Warm wishes to his family. This is very sad news to hear of the the loss of Steve. I attended several of his presentations over the years and was always impressed with his professionalism and understanding of grower needs. He certainly established himself as a respected expert in his field and a very decent person to work with. Very sad to learn of Steve's passing. His research has been invaluable to the California Wheat industry (among others) and I still rely on some of his work here in Washington. My sympathies to those closest to him. The agriculture industry has lost an icon. My wife Ana and I are completely sad about Steve's departure. We cannot beleive it yet. He was not only a brilliant scientist but also -and even more importantly- an outstanding person. We shared unforgettable moments in Yreka as well as in Argentina. Certainly, we'll miss him very much. We'll never forget his sense of humor, his sharpness, his honesty and his transparency. He was trully a good man. Our deepest sympathy to Islia, Rob, Michael and Danny. Steve, we loved you very much! Rest in peace. You deserve it! I remember this kind and caring scientist this way: Sound science based information delivered with a sense of humor in an "open and apply" package. My condolences to his personal and professional families. Sad news yet inspirational legacy. As each of us reflect on the Steve Orloff that we knew, the celebration of life theme comes through clearly. Responsive, pragmatic, and knowledgeable are the words I would use to describe Steve. You could hear the voice of the grower come through his writings, talks, and conversations. The alfalfa industry benefited in many ways from his insight and contributions. Thank you and God Bless. Thanks for writing such a perfect remembrance about Steve. I am not sure when I actually met Steve but I do remember that he was so friendly and I immediately knew that what I saw was what I got. And that was great. Very sad to hear of Steve's death. It is really a great loss to scientific world. My sympathies to those closest to him. I met him two years before and found him a very nice human being. Very sad to hear this news. Steve was a great guy, I learned a lot from him. One of the great blessings of my career was meeting and working with Steve. May Allah rest his soul in peace. Thank you for the eloquent and heartfelt remembrances of Steve. He was truly a stellar person who is sorely missed by his friends and the community he worked so hard to serve. I had known Steve for only a brief two years but already counted him as a friend and valuable colleague. I wish I could be at the memorial to tell his family personally how much I valued his friendship. I met Steve at the 2015 Alfalfa and Forage Symposium in Reno, where I first heard about his research on a puzzling interaction between glyphosate treatment and frost damage on alfalfa. I spoke to him after his talk and told him that I had seen what I thought was some bacterial disease damage along with the frost damage shown in his slides. Bacterial stem blight of alfalfa is often associated with frost because the pathogenic bacteria also cause frost to form at warmer temperatures than frost would normally form. I asked for some samples from the next year, if he wanted to pursue this. I doubted that I would get any, but I didn’t know Steve! Of course he followed through on this and sent samples from multiple locations. We did positively identify the disease and this suggested new experiments to Steve that he rapidly organized for the fall of 2016 and again in the spring of 2017. As a consequence, we have learned quite a bit about this disease, which has not been studied in detail in the past. Due to the problem of frost damage on alfalfa and the glyphosate interaction, we just obtained a $250,000 grant from USDA-NIFA to study this problem. Steve was amazing not only for his energy, drive, creativity and scientific excellence but also for his warm and welcoming personality. From the beginning of our collaboration, I was brought into the circle and felt to be a full member of the team. This doesn’t occur all that often in scientific research in which scientists can be somewhat protective of their turf. It was another example of Steve wanting to push knowledge forward and make progress for growers. What an outstanding human being! I will greatly treasure my memories and conversations with Steve and I will miss him very, very much. Es una pena muy grande, un gran hombre, con un gran sentido del humor. Steve me enseño mucho, y en poco tiempo este carismatico hombre, compartio su conocimiento y amistad. Siempre te recordare con un gran cariño Steve, una parte de ti sigue conmigo. It's a great shame, a great man, with a great sense of humor. Steve taught me a lot, and in a short time this charismatic man, shared his knowledge and friendship. I will always remember you with great affection, Steve, a part of you is still with me.